We can look to the stars and imagine how astronauts are bravely exploring the frontiers of space. However, back on Earth, it’s the Samsung Galaxy Note9 that is exploring the limits of space. It’s a ground-breaking smartphone that delivers the ultimate in performance; a new S Pen with connectivity for the first time ever; an all day, longer lasting battery and Samsung’s most intelligent camera yet. There’s no ignoring one of its mind-expanding features. The 512GB model gives you over one terabyte of storage via a microSD. That’s enough storage to save hundreds of thousands of photos, a library of 800 movies, the first five seasons of “How to get away with murder” or even 200 000 songs*. Now, that’s a game changer! The one terabyte of storage translates into having the full power of a laptop in your pocket or purse. The level of storage capacity evident in a Note9 opens a myriad of possibilities for different people in extraordinary ways. With the ever-growing world of design apps, creatives from all disciplines can now be uber-efficient on the go. The Note9 gives creatives the freedom to create, starting from the notes and illustrations that can be sketched out with the S Pen to the phones superior processing power to bring ideas to life. The extra storage goes that one step further because of the ability to save and store thousands of high res images, video files, fonts, and PSD files. And the added benefit of the breathtaking infinity display instantly transforms the Note9 into a mobile creative workshop. When inspiration hits, it’s always handy to have a studio in your pocket. Combined with the many cutting-edge audio apps available online, a DJ or musician can make and listen to mixes created in the moment. When you factor in the cost of equipment that usually needs to be carried around and the cost of it, one terabyte of storage is like music to well-trained ears. Useful software programmes and apps can run and save a plethora of soon to be perfected WAV files. This amount of storage gives musicians the room to fully orchestrate their world according to the rhythm of their greatest compositions. To keep up with the pace of modern business, South African companies are demanding more from employees, and smartphones can have an immense impact on productivity. 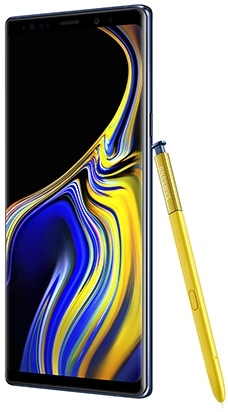 The Note9 goes the distance with unparalleled performance and tools that place an office in the palm of the hand of the tireless entrepreneur or corporate heavyweight. It also empowers employees to do so much more. With storage double that which is offered by competing smartphones, a business can operate on the move and on a staggeringly efficient level. The flood of data that flows between the office, customers, and suppliers can be managed more effectively than ever. The video is one of the most compelling and engaging types of media. It can help a vlogger establish authority, build influence, and raise engagement levels on their site. In the past, creating a high-quality vlog, required the same equipment used for professional video productions. It’s a creative and social expedition that can run up costs faster than a cat video gone viral. The Note9, however, matches the technology and specifications used by professional film crews. And with added storage, you can store take after take, until you get the one that takes the internet by storm. Not long ago a professional photographer using a smartphone for work would have been a rare sight. Times have changed. There is now a growing band of photographers who create images exclusively with smartphones. With an intelligent AI-powered camera that adjusts to its environment and light with the eye of a pro, the Note9 is perfectly at home on any set. Additionally, on a remote location, photographers appreciate the all-day battery. And the extra storage provides the platform to go further and capture more. For example, that pixel perfect hummingbird shot may require thousands of shots. But with one terabyte of space photographers can truly go wild. Space is no longer the final frontier. It’s a tool, which when placed in the right hands, can become a journey like no other. The Note9 empowers its user to do more and to save every moment along the way.